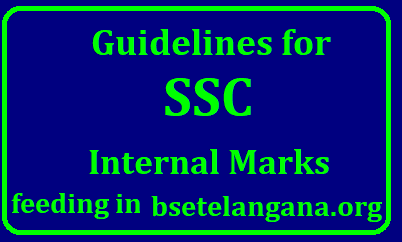 Online feeding of internal marks is altogether different from Online furnishing of SSC Candidates data.An opportunity was given for correction in students data previously . But no such facility will be provided for online furnishing of internal marks. Once the marks entered and confirmed by the Headmasters it is sealed once for all. Therefore utmost care shall be exercised by the Headmasters. The entire work should be completed under the close monitering of the Headmasters concerned. 1) The Headmasters shall keep the cumulative records containing the marks of 4 Formative tests of all the subjects of SSC March-2018 candidates. 3) Similar exercise has to be done by the Headmasters in respect of posting of subject wise marks on the cumulative records. The Headmasters may obtain the signature of individual teachers, if necessary, on the cumulative record also 2 while duly affixing his signature on the record in taken of having verified the marks posted on the record. This comple tes the authentication of records. The 13.5 may be rounded off to 14 and the figure has to be taken into account for posting. If the verage score is between 13.1 to 13.4 it has to be rounded off to 13 only. in the 3rd test and absent for 4th formative test. correct marks are posted to each Candidate. 4) The internal marks of all subjects of a candidate i.e., both curricular and cocurricular shall be entered in the computer. If any field of any candidate not entered, the computer will not allow you to move further. the data with reference to the corrections made by the students, cumulative records etc., thoroughly with the help of other teachers. Carryout the corrections if any, take the print out and verify it again to ensure 100% accuracy of the data. Officers / Mandal Educational Officers inturn will send one copy of the internal marks of all the Schools of his division to the District Educational Office on the scheduled date while retaining one copy with him.